Attach this handy cleaning brush to any sink for convenient, one-handed scrubbing. Lightweight, plastic base has 1/2 in long stiff nylon bristles. This suction brush measures 1 in x 4 in. Rubber suction feet adhere to most surfaces. 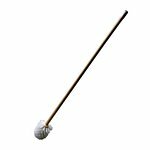 Used in the bathroom, this brush is ideal for cleaning dentures or as a fingernail brush. Can also be used in the kitchen as a vegetable brush.